10/25/2017 // Sharyn Reinhold, M.S. Research shows that more and more individuals are removing gluten from their diets. Results of the 2009 to 2014 National Health and Nutrition Surveys surrounding this topic were recently published by the Mayo Clinic. The findings suggest that roughly 3.1 million Americans are following a gluten-free diet, 72% of whom have not been diagnosed with celiac disease.1 Many of these individuals are not simply jumping on the bandwagon of the latest health trend, but rather doing so at the recommendation of a nutrition professional or other integrative healthcare practitioner. Researchers continue to investigate reasons why individuals without a known pathology to ingestion of gluten report improved health on a gluten-free diet. It is unclear whether it is due to gluten itself, other wheat proteins like amylase-trypsin inhibitors,2 high FODMAP foods (which includes wheat)3, or a combination of these factors. Regardless of the reasons for adopting a gluten-free diet, both individuals and practitioners alike should take note of some of the possible challenges that could arise. This includes the risk of exposure to hidden sources of gluten, cross-contamination, and the potential for the development of nutrient deficiencies. Individuals may be at risk for nutrient deficiencies, according to a recent review article on the topic. Published in Clinical Nutrition in 2016, the review, authored by Georgia Vici and colleagues, included 21 studies including randomized controlled trials, controlled clinical trials, systematic reviews, meta-analyses, and observation studies. They concluded that individuals following a gluten-free diet commonly do not consume adequate amounts of vitamins and minerals, particularly vitamin D, vitamin B12, folate, iron, magnesium, calcium, and zinc. These same nutrients showed up repeatedly in the reviewed studies, in which they compared the food intake of those following a gluten-free diet with those on a normal diet that includes gluten. Data was gathered using food frequency questionnaires, 24-hour dietary recalls, and 5 or 7 day food diaries. One study also found low plasma homocysteine levels and positive outcomes following folate and B12 supplementation in those on a gluten-free diet, offering further evidence of B vitamins as nutrients of interest in these individuals. The risk of nutrient deficiencies is greater if gluten-containing foods such as breads, pastas, and cookies are replaced with highly refined gluten-free alternatives. Gluten-free processed foods are typically lower in fiber, vitamins, and minerals than their wheat counterparts (both naturally and due to the lack of enrichment in gluten-free foods), as well as having a higher glycemic index. Keep in mind that this is a separate issue than that of nutrient deficiencies brought on by malabsorption due to active celiac disease prior to the adoption of a gluten-free diet. These generally normalize within one year of going strictly gluten-free so inadequate nutrient consumption beyond that is strongly correlated with poor dietary choices. It is certainly possible to eat a well-balanced, nutrient dense diet that does not include gluten. Simple changes such as aiming for a minimum of 5 servings of fruits and vegetables and the inclusion of “pseudo-grains” such as quinoa and amaranth, depending on individual tolerance, can help mitigate the risk of nutrient deficiencies. 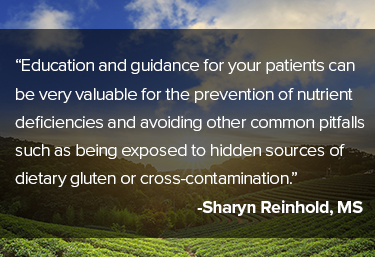 It may also be prudent to screen nutrient status on a yearly basis.4 Education and guidance for your patients can be very valuable for the prevention of nutrient deficiencies and avoiding other common pitfalls such as being exposed to hidden sources of gluten or cross-contamination. If these factors are addressed, accurately assessing the effect of gluten consumption and gluten avoidance on a patient will be easier. Clinical outcomes will be better if individuals are not eating gluten unknowingly or simultaneously missing out on other nutrients necessary for health and healing. Choung RS et al. Less Hidden Celiac Disease but Increased Gluten Avoidance Without a Diagnosis in the United States. Mayo Clinic Proceedings. 2017 Jan; 92(1): 30-38. Junker Y et al. Wheat amylase trypsin inhibitors drive intestinal inflammation via activation of toll-like receptor 4. J Exp Med. 2012; 209(13): 2395-408. Vici, G et al. Gluten free diet and nutrient deficiencies A review. Clin Nutr. 2016 Dec; 35(6): 1236-41.